Custom Designer Neon by John Barton, Internationally Renowned Neon Glass Artist "The name people INSIST on!" " If you can DREAM it, I can MAKE it ! " 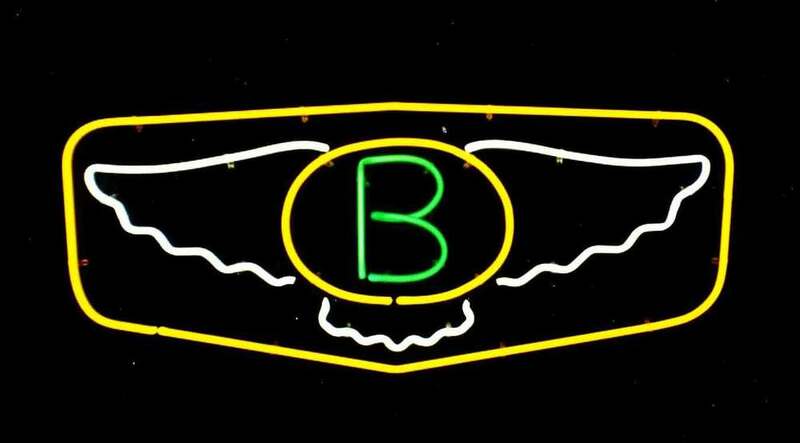 As an Internationally Renowned Neon Light Sculptor, I personally design, hand-blow, and make the very finest quality neon spectaculars. From glass, materials, finest scientific processing equipment, to mounting, you are assured that your special masterpiece will be stunningly brilliant, and premium quality throughout. Not all neon is created equal - qualities vary widely. In order to make a truly exquisite luminous neon showpiece, it requires ultimate knowledge and skill, along with precision equipment. It all starts with an artistic sketch, which is made into a full size drawing, which is then made into a neon pattern. This pattern is then reversed using special neon carbon paper, onto special fireproof neon pattern material. John Barton in his state-of-the-art Neon Studio. The magic of glassblowing is ready to begin! An adjustable ribbon burner is used to heat lengths of glass - for sweeping curves, scripts, and free form three dimensional neon artworks. A crossfire with flames converging in a central focal point - is used for right angle bends, rises, drops, rise turns, drop turns, electroding, spicing, doublebacks etc. Three sizes of hand torches are also used for welding on electrodes and splicing. Each has its own set of gas/air valves and venturi mixers.... a commercial blower is used to increase the oxygen in the flames to blow the glass. Four or five feet long lengths of various diameters of neon glass are masterfully heated and shaped, with a blow hose in one end, and cork in the other, to prevent the molten glass from collapsing on itself, and to keep proper tube diameter. While rotating, the glass is heated to proper temperature and skillfully shaped in mid-air - while blowing - on the way to the neon pattern. Timing is crucial - expert skill is critical - every second and movement counts. Then, each curvature or bend is annealed by rotating higher and higher above the flames, for slow cooling. This removes any internal stresses in the glass - very important for quality neon. For the absolute finest quality neon, I use a specially engineered and constructed - laboratory grade scientific, all stainless steel, ultra-high vacuum manifold with two ultra-high vacuum pumps working in conjunction. Digital capacitance manometer fill gauge, digital pirani high vacuum gauge, current meter, and digital temperature gauges must all be monitored simultaneously during neon tube processing. A large bombarding transformer is used to pass current through the glass - heating the glass - while pulling different vacuums at different temperatures. A control choke is used to control the bombarder - varying the voltage and current going through the glass. A final ultra high vacuum of .1 micron is achieved - the tubing is now evacuated and ready for gas. Before filling with the proper amount of gas, each neon tube is helium rinsed and bombarded - UNIQUE TO MY WORK - for ultimate purity and brilliance. The finest quality electrodes and purest gasses are critical - for long life neon with bright, brilliant colors. From artistic drawing and design, dazzling luminous artworks result. I personally create true masterpieces – both in beauty and quality. All neon artworks, chandeliers, and sculptures are self-contained, ready to hang - or tabletop - plug in and dazzle! Again - not all neon is created equally. Don't be fooled. The finest scientific equipment, components, and skill are paramount. Call 513-423-2618 Ohio, USA , Email: info@BartonNeonMagic.com - or use the EZ contact form on this website Transforming interiors - from ordinary - into SPECTACULAR! Exclusively by ... John Barton "The name discerning people INSIST on!" Shipping to all 50 States, Canada, and Europe.